Media within North Korea - known officially as the Democratic People's Republic of Korea - are among the most tightly controlled in the world, and fall under the governance of the Korean Workers' Party or, according to some - until his death - the "Dear Leader" Kim Jong-il himself. The regime bombarded the population with flattering reports about Kim Jong-il and his daily agenda, with radio and television reports often leading on Kim's guidance visits to industrial, agricultural or military sites, where he was often photographed and filmed offering advice to local workers or servicemen. North Korea's economic hardships or famines are not reported to the domestic audience, which is instead informed of technological advances as a result of the Leader's revolutionary thinking. The internet is still not readily available within the DPRK, but mobile phones have appeared on the streets of the capital after a ban was lifted in 2008. Press freedom organisation Reporters Without Borders often cited Kim Jong-il as a "predator of press freedom", with only Eritrea ranked below North Korea in its 2010 press freedom index. While state media remain tightly controlled, the NGO noted that that there had been an increase in the flow of news and information into the North thanks both to foreign radio stations and organisations which send multimedia content across the border. Korean Central Television is the state-run TV channel seen by North Koreans. The network carries news programmes, documentaries and other programmes praising Kim Jong-il and his father Kim Il-sung. 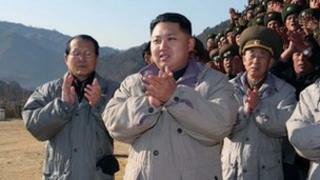 It also reports on authoritative statements from the North Korean government, party and military. In addition, it carries revolutionary dramas, operas and other entertainment programmes. Pyongyang also operates a number of national and local radio networks, including a station intended for servicemen stationed on the contentious border with the South. Newspapers, such as the official party mouthpiece Rodong Sinmun, are all owned by the state. Radio and TV sets in North Korea are supplied pre-tuned to government stations and radios must be checked and registered with the police. According to reports from dissident and defector groups, some North Koreans purchase a second radio set that is not registered, enabling them to listen to foreign broadcasts. One radio network is wired into most residences and workplaces. This carries news and commentary that is considered too sensitive for consumption outside North Korea, such as criticising economic activities that are inconsistent with national policy. Reports from refugees say that there are also those who take the risk of opening the preset radios in order to be able to tune in other frequencies. A number of radio stations operate from the South, but it is difficult to find out how successful they are at reaching their intended audience. Mobile phone use was banned in 2004, but a service was re-introduced in 2008, jointly operated by the Egyptian Orascom company and the state-owned Korea Post and Telecommunications Corporation. According to the Daily NK website, the new service, despite its cost, has proved popular among affluent party members in Pyongyang. Domestic users are said to be able to access the official Uriminzokkiri web portal via the 3G mobile phone network. Despite limited access within its borders, North Korea has become increasingly active on the internet for global users, opening official pages on YouTube, Twitter, photo-sharing website Flickr and Facebook. The main North Korean news agency KCNA launched a new website in late 2010, replacing a previous text-only site that had operated from Japan. The new site, apparently operating from within the DPRK, offers its readers news reports, photographs and video in five languages, including English and Spanish.